This wallbowl features the bold color combination of a blue-ish black background and gold topaz. 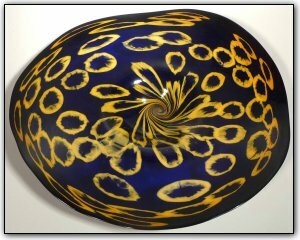 Working with murrini is a three stage time consuming process, first Dirwood hand pulled the canes used to make the murrini after which he cut the canes into the individual murrini pieces, then he used the murrini to make patterns on the glass as he made this wall bowl. In most lights this piece will appear a black and gold topaz, but under bright light will show a faint blue hue as seen in the pictures. Wall bowls can be hung on a wall just like a picture or they can also be set out as a table bowl as well. To hang the bowl on a wall, all you need is a secure hook on the wall and a hanging apparatus comes along with the bowl. Hanging the bowl is a breeze and should take less than 10 minutes. You won't believe the compliments you are sure to receive when displaying this absolutely stunning wallbowl!